Continuous operation of pressure piping and vessels is synonymous with increased productivity. Live pressure equipment also presents a significant, yet manageable, hazard to personnel. This is especially true in the context of toxic or volatile substance containment at high pressures and temperatures. Plant design and materials selection aim to minimize degradation of in-service pressure equipment; however, damage is inevitable in many cases. Hence, there is a strong requirement to justify safe operation of damaged equipment. This is formally known as a fitness for service (FFS) assessment. When damage is identified, it is crucial to demonstrate not only whether the item is safe to operate in its current condition, but also how much further degradation can be tolerated and what this means for the future of the asset. Advances in inspection technology and stress analysis software mean it is now possible and practical to proceed directly to Level 3 fitness for service to gain an in-depth knowledge of a damaged item’s integrity. Industry FFS guidelines present a range of approaches to which a basic trade-off exists between ease of analysis and the level of conservatism. A Level 1 or Level 2 assessment is possible through hand calculations or basic numerical methods which incorporate a number of conservatisms. Coarse measurement and approximations of the damaged geometry often suffice at this level of analysis. Even when highly detailed geometric measurements exist they are simplified to facilitate ease of analysis, often adding conservatism. Level 1 or Level 2 assessment methodologies are typically built around standard geometries which means one can run into limitations when dealing with more complex situations. In terms of pressure equipment, for example, isolated wall loss adjacent to major structural discontinuities (MSDs), such as nozzles or supports, represents a complex geometrical case which may require more detailed analysis. Level 3 FFS approaches provide an avenue to address complex cases which are not covered by Level 1 or 2 approaches, as well as relatively straight forward cases where the Level 1 or 2 criteria are no longer satisfied due to degradation severity. The use of finite element analysis (FEA) introduces a significant increase in modelling flexibility, providing the ability to readily handle complex geometries, loading, boundary conditions and materials’ behaviour. Figure 1 illustrates, through a relatively simple example, how data from inspected regions can be incorporated into larger models. 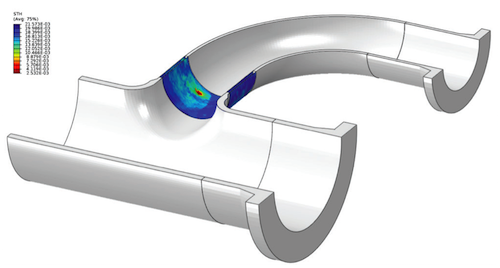 In this pipework example surrounding components could be added to investigate the effects of global mechanical and thermal loads. The flexibility in finite element modelling does, however, mean that highly experienced personnel are required to ensure models are implemented and interpreted reliably. Figure 1. 3D Finite Element Geometry Illustrating Integration of Inspected Component with Global Geometry. Level 3 FFS is often perceived as a highly expensive exercise reserved only for the most severe cases where the cost of more detailed analysis in place of repair or replacement is justifiable. Even then, the Level 3 assessment would traditionally be employed following attempts with Level 1 or 2 approaches. But there is a shift in thinking now as technological advances make advanced analysis more readily accessible. This is enabling more informed decisions, even for less critical cases which were traditionally treated with unnecessary conservatism. However i am still curious if flaw is occured on... Log in or register to read the rest of this comment. Hi Yogie, Yes you are right, the weld... Log in or register to read the rest of this comment.